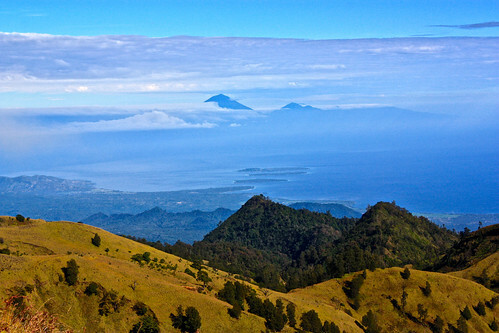 Low on cash but still want a taste of the famous Rinjani volcano on Lombok? We tell you how to save time, and money, without sacrificing the views. True, it involves a long day, but what's awaiting you on top is totally worth it. Gunung Rinjani was the main reason we were planning a stop in Lombok, but when I started doing some research on it, I was disappointed to learn that self-guided treks to the crater rim were no longer allowed. My 2010 Lonely Planet said go for it, but evidently it's now illegal. I'm pretty sure it has more to do with making money than protecting visitors. Originally we planned to do a two-day hike that took in the crater rim and the hot springs, but given our blown budget from month 5 and the sudden need to hire a guide, we decided we'd do the day hike. Everyone was aghast. "Too difficult," they said. "Too long." "You're missing the summit!" Only the last thing should concern you. If you are, indeed, inclined to do the summit, then a day hike is possible, but it's about a 12 hour day and you have to start from Sembalun Lawang on the other side of the volcano. You'll be gaining a ton of altitude in one day, so keep that in mind when you judge the distance. Since we'd just summited Mt. Kinabalu in one day, we decided that the crater rim was sufficient. We'd heard that you can pay a guide 250,000IDR for a day, plus the 150,000 entrance fee per person. So we headed up the road in search of an independent guide to take us the following morning. Perhaps it was because it was Ramadan and many guides take the month off, but finding a guide was difficult work. After getting highly inflated quotes from people who posed as guides but were really agents, we finally met someone who was willing to work with us. He started off with a 750,000IDR quote, but after we told him 600,000IDR was the most we could do, he came back with his final offer: 650,000IDR. We agreed. After all, it included pickup and drop off from our hotel, which was about 3 km away from the starting point, two bottles of water, and some snacks. That said, I'd still rather have paid a guide directly, but we literally couldn't find one to talk to. If you are planning to do the day hike, the biggest question you'll have to ask yourself is whether or not you want to see sunrise at the crater. If so, you start trekking at midnight. If not, a preferable start time is around 4:30am, so you can get to the crater rim before clouds roll in. It'll save you money and give you more options. We chose the 4:30am start time and made it to the crater by 9am. That's right, it took only 4.5 hours instead of the 7 that we were told. In other words, this isn't a difficult trek. You do gain about 2000m of altitude, but because you top out at 2600m total, you don't really feel out of breath or faint until the final kilometer. 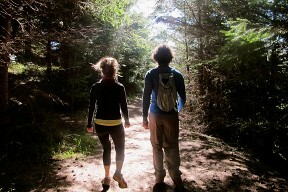 The walk is straight up, but the terrain isn't challenging until the final kilometer. And the trail is marked, so no, you really don't need a guide. You will only get lost in the views. You also won't have to pay the ridiculously high entry fee. You might encounter some questions on the mountain from other guides you bump into, but as long as you keep your head down and knees up, you can climb to the crater rim for the grand total of ZERO DOLLARS! Note: entering without a permit is definitely illegal—we think the guide requirement is mainly for job creation. We got a lot of pushback (from both guides and tourists) on doing the day hike, but looking back on it, we wouldn't have done it any other way. The views at the top were amazing, the challenge was well worth it (and not THAT challenging), and the best part was that we had the trail to ourselves for 90% of the hike. Walking back down the mountain, we bumped into 200+ people on their way up. But when we walked up, it was just us, our guide, an amazingly cute red leaf monkey, and nature. So if you're not dreaming of the summit, we highly recommend this route and this starting time. Just make sure you have a good torch (flashlight) and a walking stick. They're spectacular, cost only 10,000IDR, and are easily done without a guide. To find the second one, follow the trail that goes left as you leave the first falls. When you get to the river, walk along the bank until you can cross directly to the LEFT side of the adjoining (downhill) stream. Then find the trail on your left. Don't pay more than 100,000IDR to sleep in Senaru unless your room has hot water. We stayed at Restu By Views on the left side of the road. We had great views, but our room smelled moldy and the staff was super pushy about tours. Our friends stayed at Sinar Rinjani, on the right hand side a bit farther up. They have WiFi and a cheap restaurant, although tours from them can be hit or miss from what we heard. Sonar Rinjani has WiFi and a cheap restaurant. We ate there both nights that we were in town, and met awesome groups of people both times. See our post on overland travel between Lombok and Flores. In other words, getting to Rinjani on your own is a bit of a hassle. 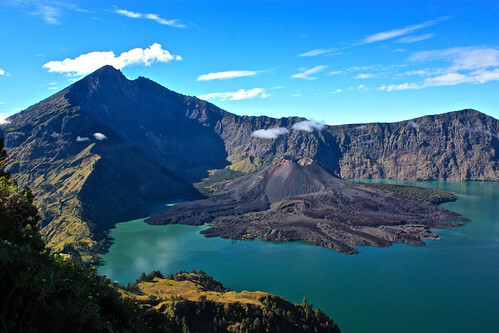 Interested in seeing the Rinjani volcano and crater without paying for a plane ticket? 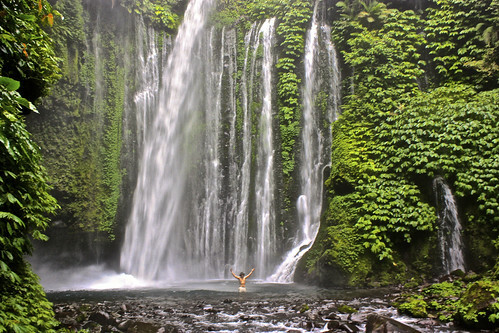 Check out our Rinjani and Lombok photo tour. 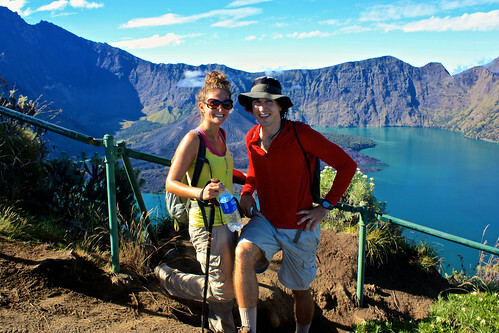 Share your tips for the Rinjani trek by leaving a comment.